It's time to trade up! Constructed of durable PVC, it has a separate fill cap, on/off valve and a hanging/carrying handle. The Camp Shower by Seattle Sports is also great for washing off dirty hands and feet. Soaking in the sun heats up this water in the black bag, creating hot water for a nice outdoor shower. The ideal tool to have while backpacking on an extended excursion. It&apos;s time to trade up! Constructed of durable PVC, it has a separate fill cap, on/off valve and a hanging/carrying handle. The Camp Shower by Seattle Sports is also great for washing off dirty hands and feet. 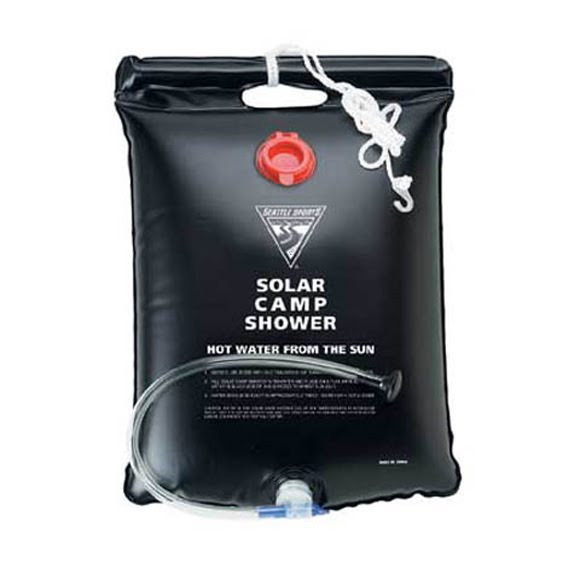 Soaking in the sun heats up this water in the black bag, creating hot water for a nice outdoor shower. The ideal tool to have while backpacking on an extended excursion.